My husband has recently been traveling A LOT for work and will travel a lot in the future so I am always looking for ideas and products that will make his traveling, packing and trips easier, quicker and more efficient! So when I saw that EatSmart, the company that made one of my favorite other travel products, had created another great travel product, the TravelWise 3 piece packing cube set, I knew it would be perfect for helping my husband pack neatly and efficiently for his work trips! 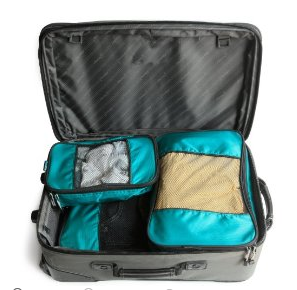 The TravelWise 3 piece packing cube set is a travel essential that allows clothes to stay folded and neat when packed in their own "small drawers". The cubes are fantastic for staying organized on short travels and long travels alike and help you avoid over packing. 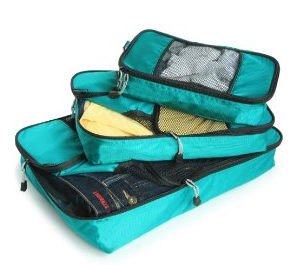 Constructed of lightweight, durable nylon, these multi-sized cubes allow you to compartmentalize similar items such as shirts, pants, undies and electronic accessories and streamline packing. Small Size 11.5" x 6.75" x 3"
Medium Size 13.75" x 9.75" x 3"
Large Size 17.5" x 12.75" x 3.25"
For extended trips that include a different city/ hotel every few days, TravelWise packing cubes let you " unpack without unpacking". Simply take out the cubes as needed , then pop them back in your suitcase when leaving. My favorite part is the fun colors that they come in! I love the purple color but I chose the Teal since I knew my hubby would be using them more! :) Plus, I personally HATE digging through a big old suitcase looking for that other matching sock or shirt I need...the clothes end up flying everywhere making a bigger mess than it was before! Ughh!!! BUT NEVER AGAIN with the TravelWise cubes! Now everything is organized and neat and matching and you just simply take them out and wear them! What a time saver! So as you start your summer trips/vacations or if you frequently travel for work, try out the TravelWise cubes. They also make a great gift for the frequent flyer, casual traveler, biker and backpacker who needs to utilize interior space to the max. 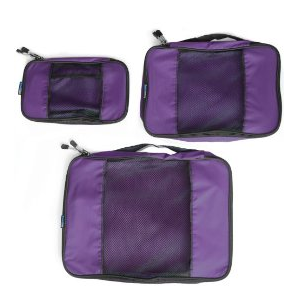 Sturdy construction offered at an economical price make the TravelWise 3 piece packing cube set a smart travel companion when going places and making memories. Win It: EatSmart is generously offering (1) TravelWise Packing Cube System (in winner's choice of color) to a lucky winner!